Today is the December Solstice, the first day of winter in the northern hemisphere. The new season officially began this morning at 6:12 AM Eastern Standard Time. Seasons are the result of the tilt of the Earth’s axis, a 23.5° angle. Today, as winter begins, the northern half of the Earth is tilted away from the sun. This position brings the northern hemisphere the least amount of solar energy all year. Today is also the shortest day of the year. Since the summer solstice in June, the sun – in its apparent seasonal journey across the sky – has been making its way south. Today, it reached its southern most position at the Tropic of Capricorn. Now, the sun will begin to move northward again and our daylight hours will slowly start to increase. Marking the transition to longer days, the winter solstice has been a cause for celebration across many cultures throughout human history. November of this year was unseasonably cool along the east coast of the United States, including here in New York City. Much of the rest of the planet, however, was exceptionally warm. According to the National Climatic Data Center, November 2012 was the fifth warmest November on record for the entire globe. Earth’s combined average temperature for the month – over both land and sea surfaces – was 56.41°F, which is 1.21°F above the 20th century average. This November also marks the 333rd consecutive month that our global temperature was above its long-term norm. While a certain amount of climate variability is natural, it is important to note that since record keeping began in 1880, our planet’s ten warmest Novembers have all occurred in the past twelve years. In contrast, the ten coolest Novembers were all recorded prior to 1920. There may be a new variety of cloud floating in the skies overhead – the undulatus asperatus. According to the Cloud Appreciation Society (CAS) – an international group of weather enthusiasts – this new cloud resembles an agitated wave that covers most of the sky. First photographed in 2006 by a cloud-watcher in Iowa, it has since been spotted several times around the globe. The CAS is now lobbying the World Meteorological Organization (WMO) to acknowledge the undulatus asperatus as an official new variety of cloud. There are currently ten cloud types officially recognized by the WMO. Most of these have a number of sub-varieties – specific Latin adjectives to describe their formation. If the undulatus asperatus is accepted as a new variety, it will be the first new cloud added to the WMO’s International Cloud Atlas since 1951. 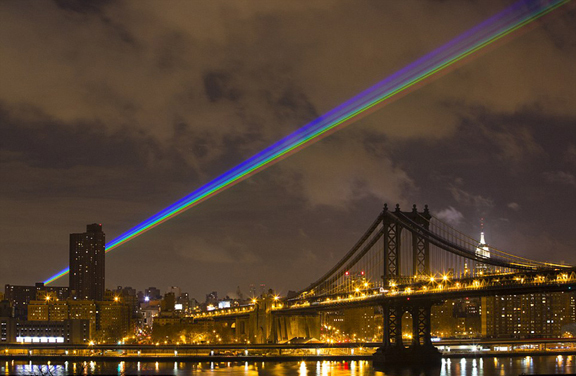 A public art project brought a rainbow to the night skies of New York City last week. Yvette Mattern’s, “Global Rainbow, After the Storm”, was a tribute to those affected by Super-storm Sandy. Composed of a spectrum of high-powered lasers, this temporary installation was situated on the rooftop of the Standard Hotel in Manhattan. Its lights beamed out thirty-five miles over Brooklyn, toward the Rockaways in Queens – areas hard hit by Sandy. While this project was not created specifically for New York, the rainbow was a timely visual symbol of hope as the city continues to recover from a devastating storm. 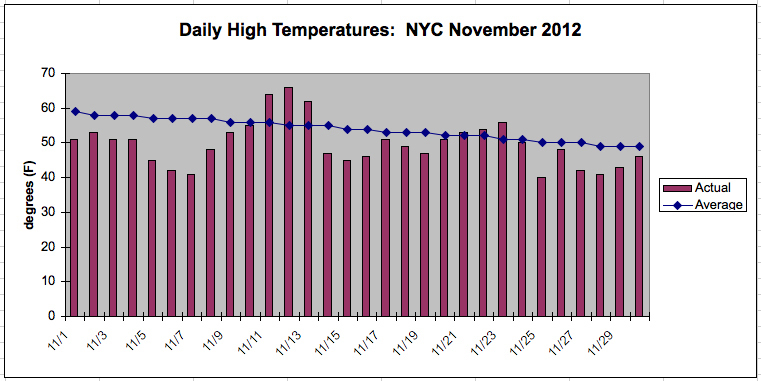 November was unusually chilly in New York City this year. In fact, we had 24 out of 30 days with below normal temperatures. This extended stretch of cool weather helped lower the city’s average monthly temperature to 43.9°F, which is 4.2°F below normal. In terms of rainfall this November, NYC collected a meager 1.81 inches. That is 2.21 inches below average. More significant precipitation, however, came in the form of snow. A nor’easter blustered its way through the city on November 7th and brought the Big Apple its first snowfall of the season – 4.7 inches in Central Park. This accumulation not only set a new daily snowfall record, but also made November 2012 the 6th snowiest November on record.